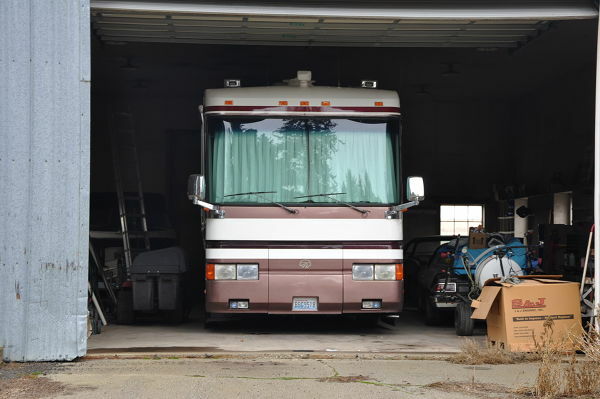 As winter was approaching, it was once again time to winterize and put away the RV for the season. Last year was the first time we had to winterize an RV, so there was a little bit of a learning curve to it. This year was nice and easy because we have a better idea of the winterizing procedure and maintenance tasks required before tucking it away until Spring. Over the course of this Winter we are finishing up all of our current projects before we hit the road in Spring. Luckily, my kind brother allowed us to store the RV in his shop for the winter. This means we can finish up with those projects indoors. The shop has a diesel heater but I don’t want to waste the fuel unless I really have to. 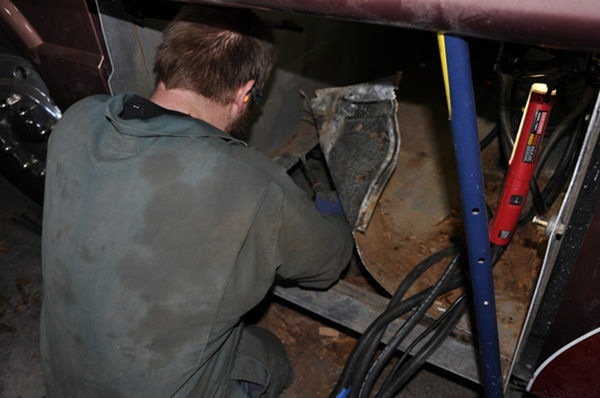 Luckily most of the RV work that needs done is on the inside. Our small space heater will get the interior close to 50°F in a short period of time so we can stay warm while we work. We recently finished a project that required replacing the floor in the battery bay. I have never done a project similar to this before. The floor was made up of thin aluminum sheeting and some rotting plywood due to some water intrusion. This bay holds about 800 lbs of batteries so I wanted to make damn sure the floor was strong enough to securely hold that much weight. We replaced the thin aluminum and rotted plywood with 1/16 inch stainless sheet. Now it’s rock solid and if water does happen to get inside, there is nothing for it to rot out. and Aquahot maintenance was completed. Water lines were drained and RV antifreeze has been added. In early 2017 I went through and replaced a number of other maintenance items, such as the transmission filters, air filter, coolant filter, sealed the roof with Dicor, and greased the chassis. Most of the regular maintenance was a bit intimidating at first but it’s very similar to working on a car as the process is the same. When I change the oil in the car, I remove and replace 4.5 quarts of oil and a small filter. With the RV I now remove a huge filter and 10 gallons of oil, but the process is the same. I also had my first experience waxing the RV. Yep, that was a much fun as you could imagine. It was like hand waxing a skyscraper. This is exactly like waxing a car except waxing 10 cars back to back. My arm felt like it was going to fall off, but once I got into a rhythm everything went smoothly. Honestly, it really wasn’t that bad because I spread it out over 2 days. I highly recommend this Meguiar’s Marine Wax. A month ago, I went to fix a few minor things and make sure there were no problems with the RV. What I unexpectedly found was one of every RVers nightmares, no, not water leaks. MOUSE DROPPINGS! There was quite a bit down in the water bay and a few droppings in the kitchen. I have a tendency to go overboard when it comes to rodents. I put out 9 traps inside the RV, spread out between the basement and the kitchen. These areas seemed to be the hot spots for droppings. Around the inside of the shop we placed 10 bait blocks, one homemade bucket trap, and a bunch of sticky traps . After 4 weeks, we caught 5 inside the RV in the traps and 8 others with the sticky traps around the interior of the shop. Also, there was a fair amount of the bait blocks that were eaten. The homemade bucket trap? Not one. People online were speaking very highly of this homemade trap but I’m not impressed. I reloaded all the traps again and moved a few things around to make sure we were hitting the hot spots. I won’t be easing up until these vermin are eradicated from the RV. Last year we got lucky, not a single mouse dropping inside or around the RV. The shop is located on the edge of a field where mice will always be. But as soon as we saw the droppings we hit the shop pretty hard with the mouse bait and traps. Hopefully we are making a dent in the population that currently resides in the shop. **Update** It’s now week 5 and there are no more signs of mice living inside the RV. Next up on the agenda is figuring out which bed and recliner we want to take with us. Currently in the RV we have the original club chairs that have been reupholstered in ultra-leather and a Sleep Number 5000 bed. In the house we have an additional 3 recliners and 4 beds to choose from. At this point we are undecided on which will fit our needs the best. I would like to try out the club chairs and see if they will work for us but I’m not a fan of the Sleep Number bed. Right now, we are leaning toward using our Tuft and Needle mattress in the RV but are still undecided. This last weekend I began sourcing new batteries. The batteries we currently have are Lifeline 8D batteries. They need to be replaced and I hope to replace them with the same brand or a different brand that is similar. I’m not going to lie, this bill is going to hurt. (5) Lifeline 8D’s are thousands of dollars no matter where we find them. New tires are on our priority list but I think we will get those replaced in Oregon when we get there in June. No need to pay sales tax in Washington if we don’t have to. 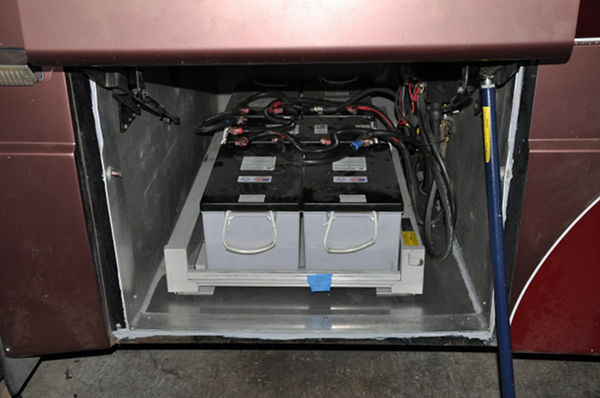 We knew that the tires and batteries were getting old when we bought the RV and adjusted the price accordingly. But still, multiple bills that climb into the thousands will sting a bit when unemployed. Thankfully, the stock market has been very kind to us over this past year. These are a few of the RV related things we have been up to lately. But there is still a long to-do list at the RV and the house. With Spring approaching quickly, we better pick up the pace. Spring is Coming!!! I am looking forward to having a front row seat for your adventure! Travel safe, my Adam. It’s great to hear from you! It’s been a long time since I’ve talked to you. So glad you found the site and are going to stick around for the adventure. I hope you enjoy the view from your front row seat. Next PostNext The Purge Continues… And Do We Bring This?